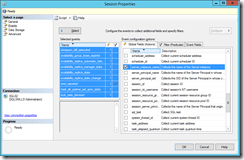 When the UI for Extended Events was introduced in SSMS 2012, Microsoft included the ability to merge multiple XEL files into a single view in the UI, which can be really useful during AG problem analysis. All you have to do is grab the AlwaysOn_health*.xel files from each of the replica servers, copy them into a folder and point the UI to the folder using the File > Open > Merge Extended Event Files… menu item and you can see all of the events from all of the servers in a single place. EXCEPT…. 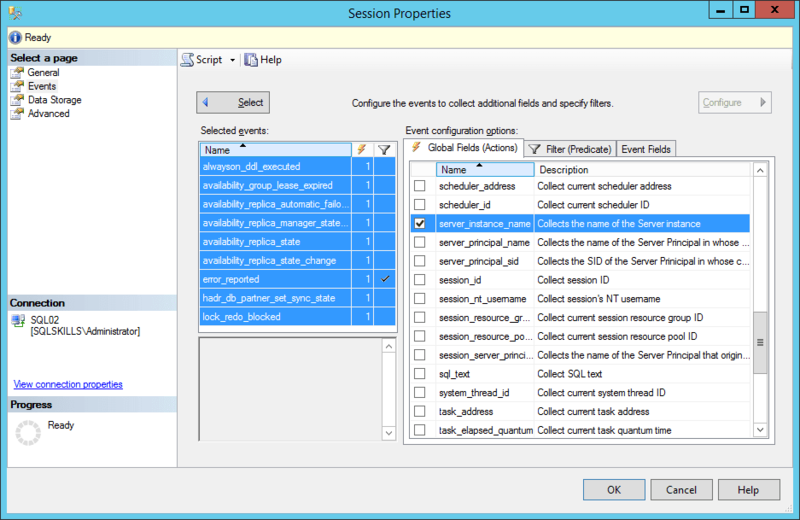 there is no server instance name contained in the events by default so this becomes of limited use without modifying the AlwaysOn_health event session to add the sqlserver.server_instance_name action to all of the events. This is easily accomplished in the UI using the multi-select options of the Configure tab on the event session properties as shown below, or may also be accomplished using the simple DDL script included at the bottom of this post. Once the event session is modified, the files can easily be merged together in the UI for all future troubleshooting and each event will have the originating server_instance_name attached to it by the action. Cool! Do you think this is more useful than just getting the full cluster logs from all the servers?